Just when you think you've got the region figured out… Wow, did last week give us a lot to think about, and there was a great deal of movement in our rankings as a result. Let's not waste any time. Continue below for this week's Top 10. 1. Nipmuc: 7-0, 5-0 Mid-Mass. Last Week: Ranked No. 4, defeated Northbridge 17-1 and Belchertown 21-0. There are four teams with cases to be No. 1, and maybe Nipmuc didn't have the hardest week, but the Warriors are undefeated, and their one-goal win over Grafton looms large for me. While every other fan base can say "hey, we only lost that one game by one goal," Nipmuc has beaten everybody put in front of them, and sits alone atop the Mid-Mass. standings. Yes, things get tougher this week with a Tuesday home game against Worcester, a Thursday visit from Pope Francis and a Saturday showdown with Groton-Dunstable, but this team is legit. "Nobody expected it, but I knew Nipmuc was going to be really good this year," one local coach said. "They just have so much speed and skill in their midfield. Most teams, you can lock your poles up against their attack, but with them it's like, what do you do?" It may be unexpected, but the Warriors are No. 1 in our poll for the first time ever. 2. Grafton: 9-2, 5-1 Mid-Mass. Last Week: Ranked No. 3, defeated No. 1 St. John's 6-5 and No. 9 Hopedale 13-5. Even I'm surprised that I'm not ranking the Indians No. 1 after they dethroned St. John's in come-from-behind fashion, then controlled things against Hopedale. But, at the end of the day, Grafton played Nipmuc, and Nipmuc won. That's why they play the games, or so I'm told. Those two will play a massive rematch with the Mid-Mass. title on the line on May 9th, but Grafton will have to get through two tough league games this week first. The Indians host Tantasqua on Tuesday before traveling to Worcester on Thursday. 3. St. John's: 7-2, 1-0 Catholic Conf. Last Week: Ranked No. 1, defeated Framingham 19-5. Lost to No. 3 Grafton 6-5. A one-goal loss to one of the best programs in the region drops you two spots? Yep, that's the kind of week it was for the Pioneers. Still, St. John's did bounce back to blast a pretty good Framingham team, and has a big week coming up against Western Mass competition. St. John's travels to South Hadley today, then hits the road again for a playoff rematch with powerful Minnechaug on Wednesday. A busy week ends Friday with a visit from Westford. 4. Groton-Dunstable: 9-1, 3-1 Mid-Wach A. Last Week: Ranked No. 2, defeated Algonquin 12-6 and No. 5 Littleton 6-4. Lost to Shrewsbury 10-9. A one-goal loss to one of the best programs in the region drops you two spots? Yep, that's the kind of week it was for the Crusaders. Repetition aside, Groton-Dunstable lost a thriller to suddenly resurgent Shrewsbury, but won a tight one against Littleton and handled Algonquin. In any other week, that probably doesn't drop you very far, but this was far from a normal week. G-D will be back in action at home against Weston Tuesday and St. Bernard's Thursday, before a big trip to Nipmuc on Saturday. 5. Littleton: 5-2, 3-0 Mid-Wach B. Last Week: Ranked No. 5, defeated Leominster 12-3 and Nashoba 11-6. Lost to No. 2 Groton-Dunstable 6-4. Littleton's defense has really been a pleasant surprise early on in the season, and it nearly carried the Tigers to a slug-fest win against G-D. Either way, Littleton still took care of business against a pair of league foes, and remains unbeaten in Mid-Wach B. The Tigers are on the road for three games this week, first at Oakmont Tuesday, then at Tyngsboro Thursday, and finishing up at Westford Saturday. 6. Tantasqua: 6-3, 3-2 Mid-Mass. Last Week: Ranked No. 7, defeated Northbridge 12-4, Worcester 12-9 and Auburn 12-2. Lost to Minnechaug 12-11. 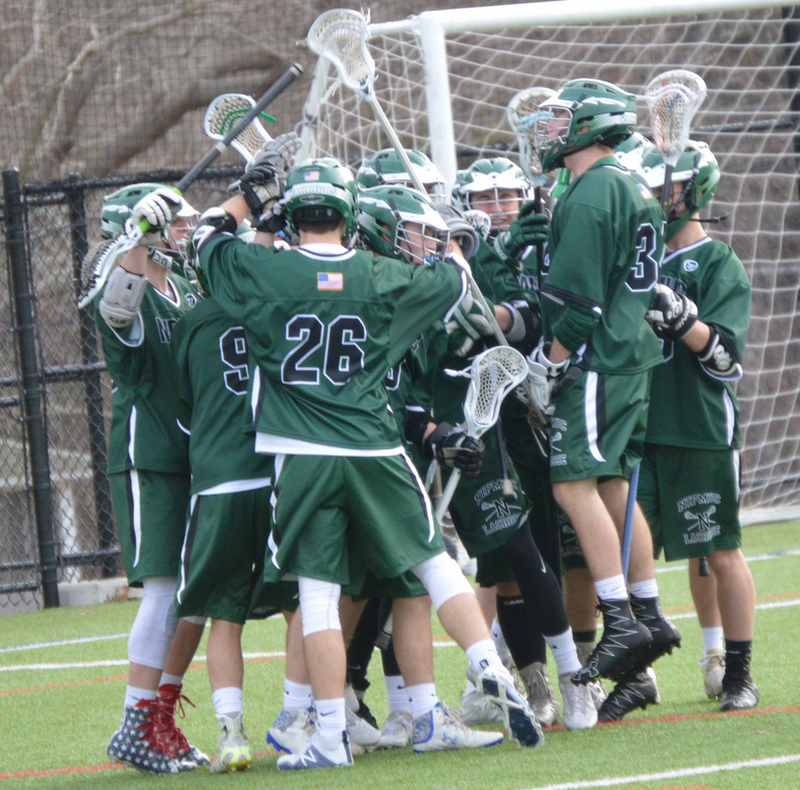 The Warriors nearly pulled off a huge upset against Western Mass power Minnechaug, then proceeded to blowout Northbridge and Auburn, and come back in a close one against league rival Worcester. The Warriors are finding ways to win, and are finding their feet defensively. They'll need their best defensive effort yet at Grafton Tuesday, followed by a trip to Northbridge Thursday and home game against Westboro Friday. 7. Shrewsbury: 5-5, 3-0 Mid-Wach A. Last Week: Unranked, defeated No. 8 Wachusett 12-11, No. 2 Groton-Dunstable 10-9 and Nashoba 11-3. As good as all the teams in the top four have been lately, nobody had a better week than Shrewsbury. Not only did the Colonials knock off a pair of ranked, league rivals, they seized first place in Mid-Wach A and took a victory from their main competition in the league (Groton-Dunstable). A brutal early schedule has prepared Shrewsbury well and, with the emergence of Cole Russo and Colin Michael to complement Matty Ward offensively, this could be the team to watch the rest of the way. Today brings an interesting test against struggling Marlboro, before Shrewsbury hosts rival Algonquin Thursday in an always intense battle. 8. Wachusett: 5-4, 1-2 Mid-Wach A. Last Week: Ranked No. 8, defeated No. 10 Shepherd Hill 10-6. Lost to Shrewsbury 12-11. The Mountaineers did bounce back from their heartbreaking loss to Shrewsbury by taking out a good Shepherd Hill squad, so I can't knock them. Wachusett probably won't be able to make up ground in the Mid-Wach on Shrewsbury and G-D, but this team still has a ton to play for, and the talent to make some noise in the postseason. This week they'll have to remain focused, as their Tuesday opponent (St. Peter-Marian) and Thursday opponent (Westboro) have won a combined two games. These are the kinds of weeks where it's easy to lose sight of goals, but Wachusett has the senior leadership to keep its eye on the prize. 9. Hopedale: 7-1, 3-1 Mid-Mass. Last Week: Ranked No. 9, defeated Pope Francis 17-4. Lost to No. 3 Grafton 13-5. Hopedale isn't there physically to play with Grafton, but the Blue Raiders bounced back to knock off a good Pope Francis team, and did so in dominating fashion. Perhaps most impressively, Hopedale held Pope Francis star Cam Peritz, who came into the season with 419 career points, to zero points on the day. Business picks up quickly as the Blue Raiders travel to St. Bernard's today, then Northbridge on Tuesday, followed by a home game against Blackstone Valley Tech on Thursday. 10. Shepherd Hill: 6-3, 3-1 Mid-Wach B. Last Week: Ranked No. 10, defeated Leominster 17-6. Lost to No. 8 Wachusett 10-6. The Rams couldn't quite pull it out against the Mountaineers, but the win over Leominster means they continue to take care of business in Mid-Wach B, where they are tied for second place (with Tyngsboro, a team they defeated earlier in the season). Tuesday brings a home game against Hudson, before the Rams host Marlboro in another big Mid-Wach B showdown on Thursday. Speaking of Marlboro, the Panthers dropped a pair last week, and fell out of our rankings for the first time this season. Making matters worse is the fact that Marlboro lost to league foes in Nashoba and Tyngsboro, but both games were incredibly close and competitive. The heart of Mid-Wach B is very strong, and Marlboro is too talented to fade away. Tyngsboro got back on track with three wins last week, most notably the aforementioned victory over Marlboro. Algonquin, meanwhile, opened the week with a tough loss to Groton-Dunstable, but bounced back to beat both Westboro and Leominster. Unfortunately for the T-Hawks, they couldn't hold onto a halftime lead against Eastern Mass power Acton-Boxboro last night. BVT scored a big win over Monty Tech last week that helped the Beavers grab first place in the Colonial, while Nashoba's win over Marlboro last week has the Chieftains in the conversation. Finally, St. Bernard's keeps piling up Ws, most impressively a 7-6 win at North Middlesex. But, can the Bernardians keep it up with Hopedale and Groton-Dunstable on tap for their next two outings?